Yesterday's post about the most popular posts for me this month led some to comment on the random, rather wide-reaching subject matter of the popular posts. This is true, which may mean I need to refocus the blog itself...I think the 31 days of blogging lets me wander a bit off track with subject matter and that's fine, but if I want you to "feast with me," I really should be blogging about...food. 1. I need to focus more. 2. I need to really write a lot to get a little of great. Essays require craft and honing and editing. I need to write more and edit more to get a few good posts a week, in hopes that I'll end up with a few great posts every year. 3. I love reading compilations. I learn a lot when someone takes the time to show me what they've been reading. I think I will keep this feature, but focus more on the food world. 4. I need to set firmer hours for work. True, the freelance life is about flexibility, but there have been days when I've flexed myself right out of any work at all. Not a good way to be a successful freelancer. 5. I need to give myself permission to read more during those work hours. Reading about what's going in in the food world is part of my job. I think I sometimes feel almost guilty about "just" reading...but that's crazy. 6. There is always room for improvement. My goal for the next year is to really hone the craft of writing. Focus on craft and focus on business. Because in the end I really do like to write. 7. Sometimes a photo is enough. 8. Even *I* can write a haiku, one that might make someone smile or tug at your heart a bit. 9. Wordle is always fun. Yes to #5! I feel the same way. Reading during the work day makes me feel guilty too, but you're absolutely right: if you're a writer, reading is a big part of the job. I've learned to be a bit more loose with my content. For a while I stopped blogging because I thought I had to be making recipes all the time. The cost of the ingredients, the photos - it all stressed me out. Now I'm thinking that as long as I write about food (most of the time), I don't always need to write about cooking food. This has given me new enthusiasm for blogging. focus- these appears to be the word that keeps banging me upside the head- and I know I need to STOP and really think about it!! Also totally agree that you need time to READ- they say every great writer is a good reader!!!! :)....Looking forward to many more great blog posts from you. 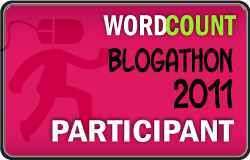 During the blogathon I also noticed the importance of word craft. The process of planning and scheduling posts gave me time to go back and review them. It improved the final product. Van, I agree! I did more editing this month than usual and that is always a good (and often satisfying) thing.